Learn The Insider Secrets To Saving Time, Money And Stress So You Can Have A Wonderful Wedding! Yes, it is possible to plan a wedding without breaking the bank or losing your mind! It's really very simple - when you know how. If you have already spoken with the wedding planner from hell, send Brunhilda packing. Or at least put her on hold while you have a chance to consider your alternatives. Yes, there are alternatives and they don't have to set you up with Prozac for the rest of your life. This should be one of the happiest times of your life. If it's turning into your own personal nightmare, you need to step back and re-consider your options. 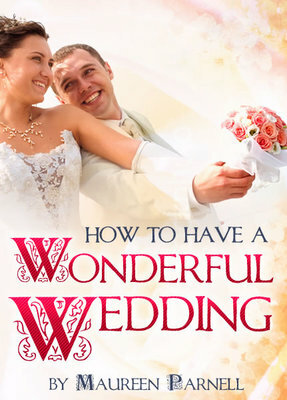 What you need to know is "How to Have a Wonderful Wedding!" And, we have exactly what you need. This guide will not only answer the questions you have, it will also answer the questions you forgot to ask! The easiest thing to do is elope! However, that isn't the way to make friends and influence in-laws, let alone your own Mom. Look, it is possible to have a beautiful wedding without breaking the bank. "How to Have a Wonderful Wedding" takes you by the hand and step by step shows you exactly what you need to do to insure a happy, joyous occasion. We can't promise you that your marriage will live long and be fruitful, but we CAN guarantee that "How to Have a Wonderful Wedding" will answer your every question about how to have a wonderful wedding without breaking the bank or ending up in the loony bin! If your wedding plans are on the horizon or someone you know and love has one to prepare for, this is the "must have" guide for you. Eliminate the stress, cut the costs and make your wedding day one you will cherish. Don't want a Professional Planner? Don't want a Professional Photographer? Don't want a Professional Videographer? Don't want a Professional Master of Ceremonies? Don't want a Professional Caterer? Up a Tree or Below the Sea! The "Easy Way" Out - Elope! Maureen Parnell was a part-time singer and musician who specialized in weddings and other functions around her home town. She began to suffer from arthritis and had to give up her performing. Then, she started to teach music and singing to children and adults. This is her first book and she has used her experiences with her customers and also people she knows to provide a wide range of tips and suggestions. She hopes "Your Wedding, Your Way" will help new brides start right and even give people that have already been through a wedding or two some tips they wished they knew before. Macrame - 20 High Quality PLR Articles Pack! Wine Tasting - 30 High Quality PLR Articles Pack!